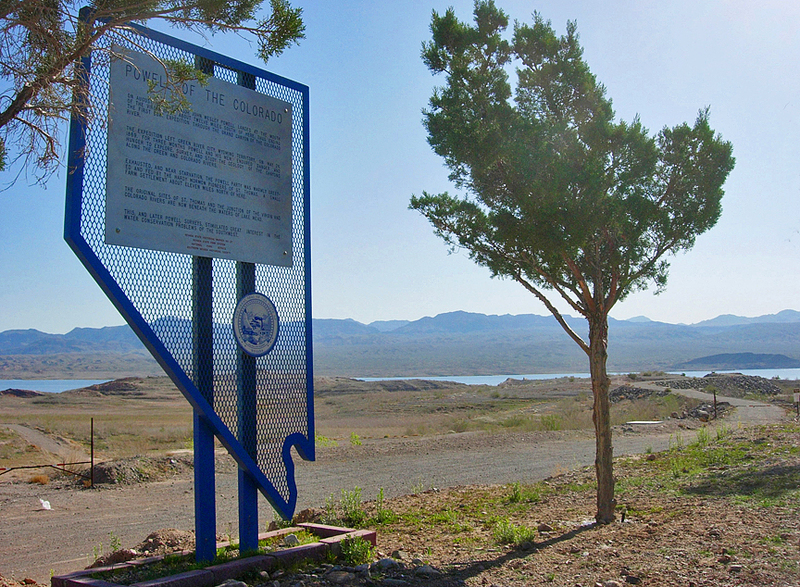 So what happens after visiting all of Nevada's 271 historic markers? We find out which ones are best of the best! This is our "Supers" Page, a list of select historic markers that are most note-worthy and stand out among the rest. I think you'll find this page fun, and most of all, informative! We thought long and hard about which markers made the cut and the results and well ... we hope you find them exactly "super!" You'll also find the same superlatives mentioned within the main marker page where applicable. On your own marker hunting expedition, be sure to pay extra kudos to these special superlatives. How many of these have you been to? Feel free to "like" and "share" to your thumb's content. We won't tell. No other marker in the system comes close to this marker's extreme elevation. - Mt. Rose Weather Observatory sits at 8,900 feet in elevation making it the highest marker in Nevada! How high? The flanks of Washoe County's highest point sits less than four miles (as the crow flies) from this marker. If you're visiting here in the winter and spring, bring a scarf, a hoodie, or some thick britches will you? Find this one atop Mt. Rose Summit on SR 431, 8 miles east of Incline Village. Fun Fact! Mt. Rose Summit doubles as an excellent base jump for area recreation. Park here at the marker and begin an excellent 6 mile hike to the top of Mt. Rose following the scenic Mt. Rose Trail. Allow a full day to the top and back. Even if you never see the summit, aim for an impressive set of waterfalls a short 1.5 miles from the trailhead that are made even better around mid-June for some impressive wildflower blooms! 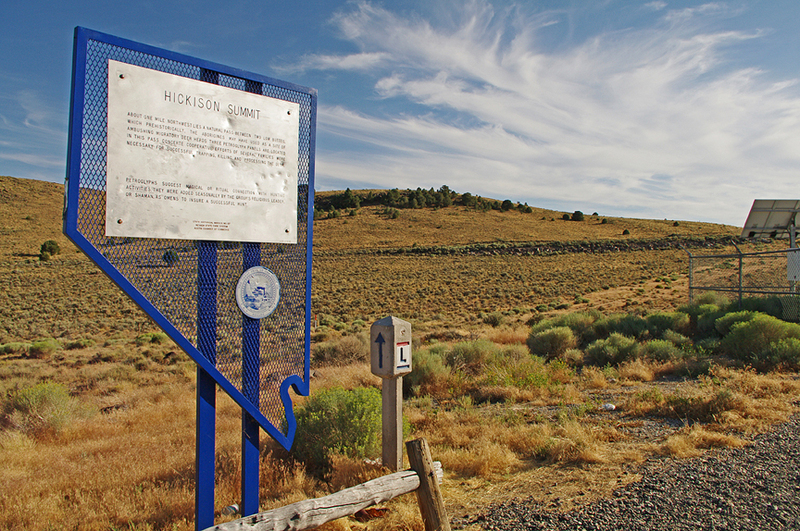 Sitting at only 550 feet above sea level,  - Von Schmidt State Boundary Monument takes the crown as the lowest marker in Nevada! Yet even this title has been stretched thin because this marker technically sits in California making this claim to fame debatable. If we're counting markers within Nevada proper, then this superlative goes to  -- Old Spanish Trail at an elevation of 1,131 feet. resides a little over one mile south of the Nevada state line approximately one mile west of the Colorado River south of Laughlin in San Bernardino County ... California. Superlative #2: This strange duck is the only Nevada state marker that resides in another state. Although it might sound ridiculous, the SHPO had good reasons for doing so, and much ado with funding. The California Historical Landmarks Society partnered with the SHPO to build their own versions of the Von Schmidt Monument, which so happened to be one mile into the Golden State. See CA #859 here. How's that for a strange one? Fun Fact! The southernmost point of Nevada sits right in the heart of some interesting geography. Both of these markers, while located at least fifteen minutes apart, both lie within ten minutes of two neighboring states: California on the west and south and the Grand Canyon State of Arizona on the east upon crossing the Colorado River. Speaking of the Colorado and should you make it down this far, make it a point to stand within three states at once by visiting the lowest point in Nevada! 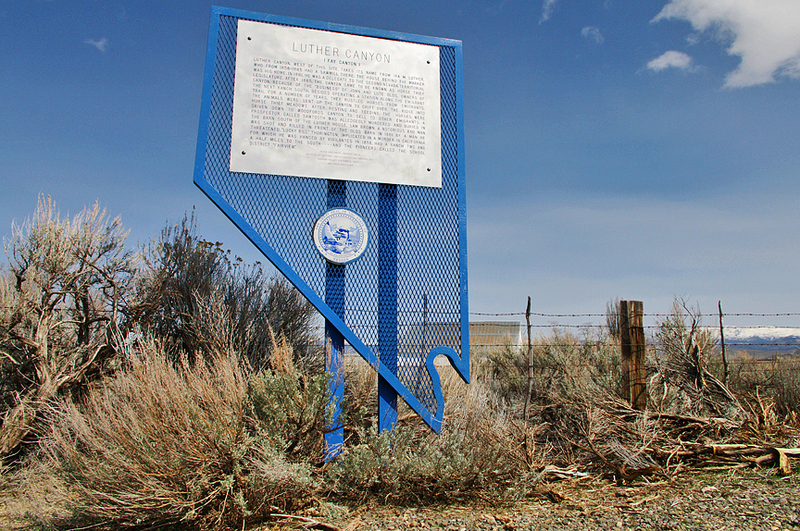 - Luther Canyon has been officially catalogued as the westernmost marker in Nevada, sitting approximately 680 feet east of the California state line. Upon first visiting the marker you might not think it is the westernmost, but it all has to do with the state's long diagonal border that separates it from California - a border that isn't relatively apparent since it sits in wilderness country. At this particular spot, SR 206 hugs the border by making a quick swing southwest coming less than 700 feet from the state line. How's that for some funky cartography? Fun Fact! As the marker explains, Luther Canyon was a popular hideout for many outlaws who stole horses in Carson Valley during the late 1800s. Men would bring the animals deep into the innards of the canyon and over the state line into California (and out of jurisdiction) which was less than a mile from the valley floor. The canyon's rough terrain would make it difficult for law enforcement to pursue the outlaws. Today, the pretty forests of Luther Canyon make it a popular out-and-back hiking route with maintained walking and equestrian trails during the summer. Find the trailhead right across from the marker! Fun Fact! Known today mostly for its five-star greens and more than 300 days of blue skies and summertime, Mesquite could be one of the oldest places of habitation in Nevada. The Virgin Valley is known historically as an important cultivation area for the Anasazi people beginning around 800AD to 1100AD. Much later, the area attracted Mormon settlers along the Virgin and Muddy Rivers, specifically in Bunkerville, still a tiny community just west of the city. We believe that the oldest house in Nevada could remain in Bunkerville, a structure estimated to be built around 1842! 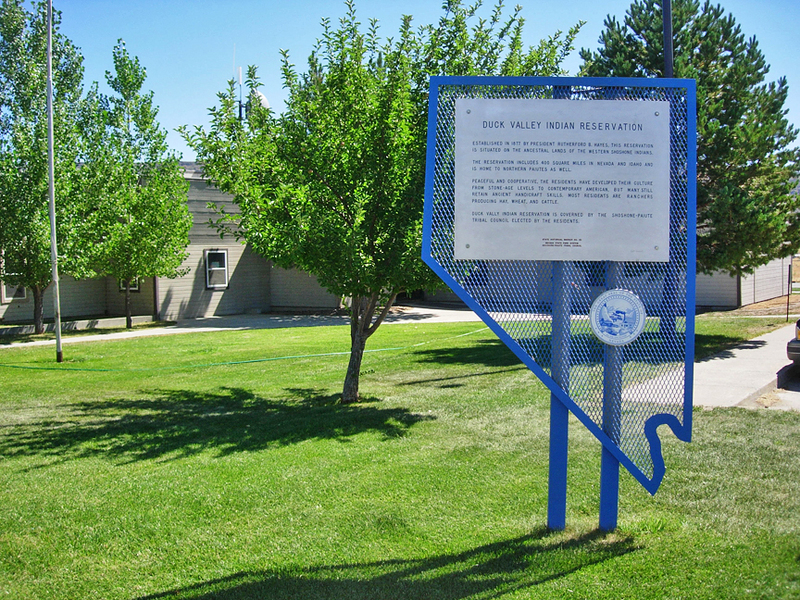 - Duck Valley Indian Reservation reigns supreme as the northernmost marker in Nevada - sitting just 300 yards (563 feet) south of the Idaho state line! 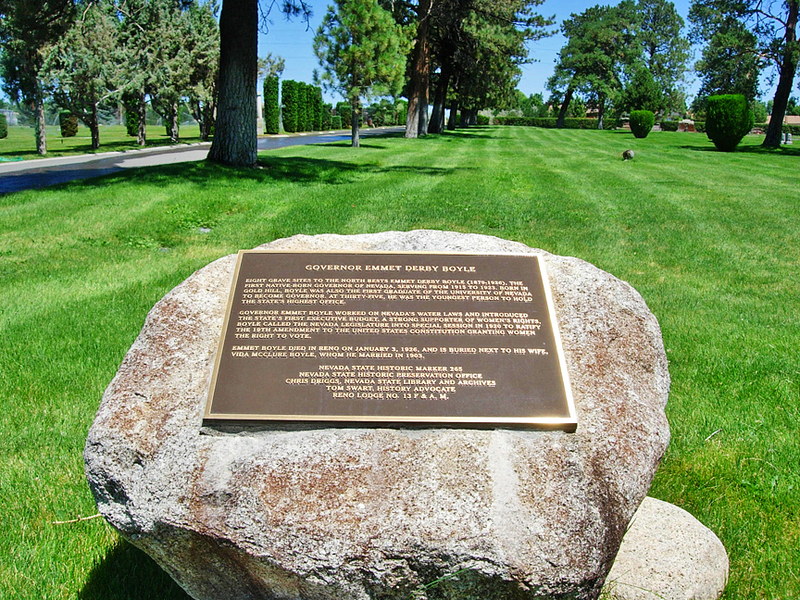 Though it's placement is odd to us, the marker is actually centrally located within the reservation that that extends over the state line into Idaho for several dozen miles. Find  at the main Tribal Headquarters just before crossing the state line on the Mountain City Highway (SR 225). Superlative #2 Like all reservations in the United States, the Duck Valley Indian Reservation is an individual sovereignty with its own rules and customs. 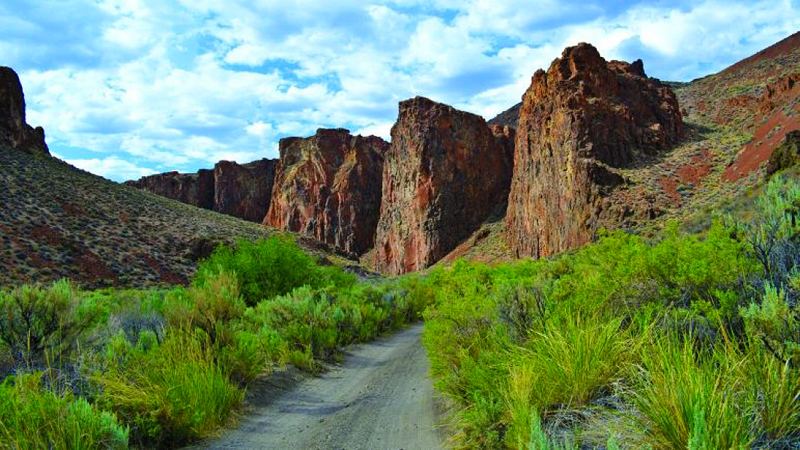 The town of Owyhee, Nevada, located entirely on the reservation, is one of only three communities in Nevada that observes Mountain Time. Yep. is one of only two markers in the state that resides one hour ahead of all the others! Having visited every marker in the system we have confirmed another superlative for  - Von Schmidt State Boundary Monument this time as the southernmost marker in the system - 1.2 miles south of the Nevada State line. Since this marker technically sits in California, its claim as the southernmost marker is debatable. Strictly speaking since  is very much a part of the State Marker System, it must be included, therefore granting this marker its official designation as the southernmost ... even though us purists believe it otherwise. For everyone's sake in all corners of the debate let's acknowledge another scenario. If we're counting markers strictly within Nevada proper this superlative immediately goes to  -- Old Spanish Trail, a long tenured-MIA that was recently replaced in 2013. Partnerships decided a great placement for  would be along Needles Highway, 6.5 miles north of the California state line. Whew! How's that for a touchy title? Fun Fact! The Von Schmidt State Boundary Monument, although close in its accuracy, is off by approximately 1.2 miles. 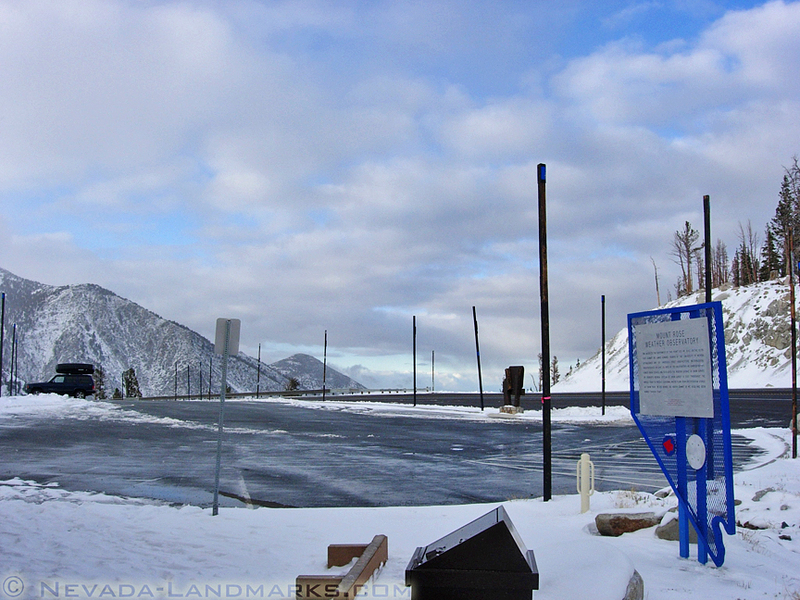 You can see this upon visiting the marker as you stand in the Golden State and look north into Nevada! No other markers come closer to being literally in the middle of the state! Some of you may be wondering how we found this distinction as "centrally located" in irregularly-shaped Nevada. Visit my Journey to Nevada's Geographical Centerfor these reasons and the awesome binge into the wilds behind it! 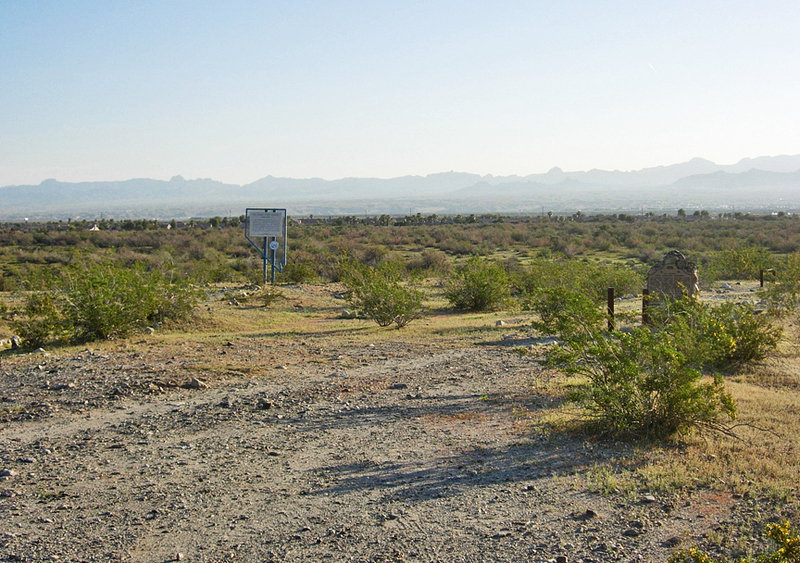 , located 24.8 miles east of Austin, is the closest marker to Nevada's geographic center. As the GPS bird flies, find this marker perched atop its namesake summit on US 50 in Lander County, about 25 miles due northeast of the approximate center. Fun Fact! Just two short miles east of Hickison Summit you will find the Hickison Summit Petroglyph Site. (Look for the signed turnoff.) This series of glyphs represents the game trails that occurred near the summit with much of the rock art depicting game, hunters, and the rising and falling of the seasons in this harsh terrain. Could this have been native people's "post-it" notes? The pretty pinion forest setting makes Hickison the perfect site for a quiet picnic away from the crowds and its few trails offer a good chance to stretch those legs. Keep in mind that it has suffered some vandalism being one of the more accessible rock art sites in the state. Do us all a favor. Please report any and all vandalism that you should run into at the site on your visit. Post-its forever. Many of you Jarbidge fans may be reeling in disappointment and I can assure you that this wasn't intentional. Okay, maybe it was, but there is good reason for this. "The most remote" marker distinction was solely based on ADT (average daily traffic) surrounding the marker, in this case, the Soldier Meadows Road and its surrounding routes. 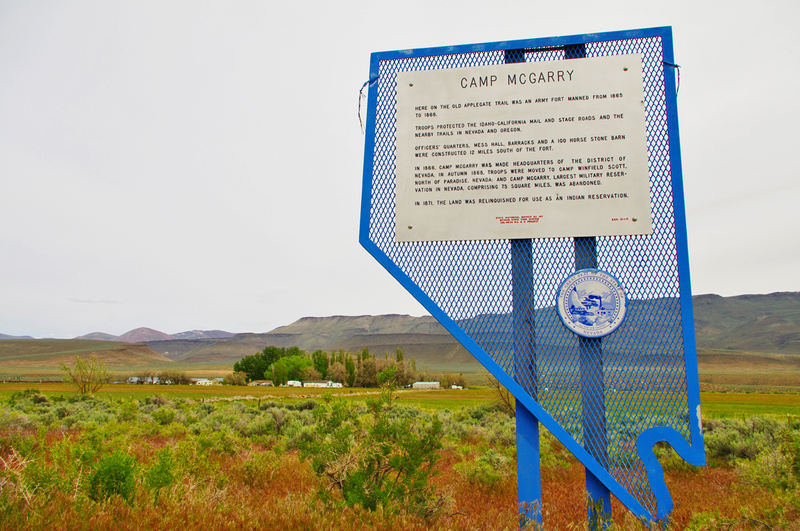 Although  and the Jarbidge markers are equally remote in terms of distance from a major community, the Jarbidge markers are located within an actual community with a year-round population. By comparison, the only thing you'll find near  is a ranch, a remote guest ranch that oversees one of the most remote acreages of land in the lower 48 states. Less than .001% of Nevada's population resides within 200 square miles of this remote place that's been lovingly named, "the northwest corner." The Soldier Meadows Guest Ranch serves as the only form of "services" in the surrounding area, including the High Rock Canyon area, the Summit Lake Indian Reservation and acreage as far west as Cedarville, California, east to Denio, Nevada and north to Adel, Oregon. Unless you count guest lodging and maybe a meal, the word "services" is stretched very thin. Finally, unlike Jarbidge, neither Summit Lake nor Soldier Meadows can be defined as "towns," "villages," or even "outposts" per Nevada vernacular. Soldier Meadows is simply a point of reference and a convenient guest ranch within that point of reference. The owners of the Ranch take good care of the marker and promise to keep it nice looking for future marker hunters! See them if you're planning your visit ... and take everything with you (including the kitchen sink!). To emphasize the wonderful remoteness of this area, I highly recommend visiting my Trip to Soldier Meadows which records every mile of this incredible journey! Fiddlesticks. Did you really think we'd forget about these lovely runners-up? In order from most to least ... Long live the "remoteness!" in extreme northern Washoe County, sits all by its lonesome along County Route 34. For obvious reasons, many Nevadans refer to the northwest corner as the "forgotten corner," a place where the human population averages less than .001 percent. You'll find this marker between Vya (Ranch) and Gerlach (41 miles to the south), a location right in the middle of all that beautiful open space. The nearest services heading north from  are Cedarville, California, 68 miles in Alkali Valley, or Adel, Oregon, 75 miles in Malheur County. Choosing between this one and  was painfully close! The Jarbidge Markers in northern Elko County have been paired for the next spot and for the sake of consistency, neither one takes the cake over the other. Although each of these is two individual markers, they've unofficially been categorized as one by the SHPO and by all marker hunters and geocachers. 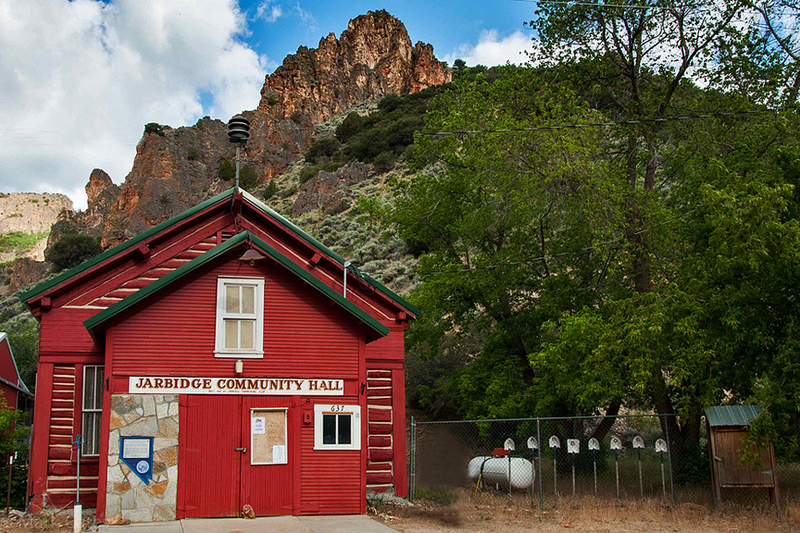 The Jarbidge markers reside within what's been crowned as "Nevada's most remote town" and although Jarbidge is a tiny hamlet (population 18 to 84 depending on the season) with one main street, it is a town with active businesses and basic services, including gas and a deputy sheriff, thus knocking its "remoteness" factor down a notch. Find Nevada's most remote town by heading north out of Elko for 102 miles. Jarbidge can be accessed only via two main dirt roads from the south or by one year-round route in the north from Rogerson, Idaho. - Ione in northern Nye County finishes off our top three list in another beautifully remote way. Ione, declared a "living ghost town" by some, can be found 20 miles east of Gabbs in the Shoshone Range, just a few minutes north of Berlin-Ichthyosaur State Park. Unlike the other two runners-up, this one is located in a central position on the Nevada map, but at least one hour from any community, in any direction. This small village of about forty year-round residents was best described as a "still-beating heart" by David Toll in his excellent book, The Complete Nevada Traveler, and visitors here still get that feeling of intense nostalgia. Want to get here? We can't say we blame you. The only way to get here is by way of County Route 21, a county-maintained dirt highway that begins at Berlin-Ichthyosaur and connects back to civilization just south of Austin in the Reese River Valley. - Old Geiger Grade (In Canyon Below) wears the ribbon for being the marker closest to a county line. What do we mean by this title or how close are we talking? is within one foot of the Storey County line! (Again ... guess how we know this?) The road turnout itself sits fully within Storey County, but the marker itself barely happens to scrape (touch into) Washoe County courtesy of the county's awkward zigzagging western border. Recently NDOT installed a side barrier for safety and thus officially placing the marker outside the barrier. Find this marker along SR 341 immediately north of Virginia Highlands. This turnout comes fast on this windy roller coaster highway so be on the lookout! I'll admit: choosing a winner for such a title might seem a bit biased, but let me assure you that this title was the one most shuffled around on the round table. If this winner is anymore evident in 2010 over fifty emails alone were sent my way asking for its location, the most inquiries I've ever received out of any marker in the system. I think this alone would suffice it a winner. Yep,  - Governor Emmet Derby Boyle wins the top prize as the hardest marker to spot in the entire state. Some people may find it ironic that we've selected this such a marker from the very bowels of urban Reno, but then again, chew on this. Without a map, a guide, a plot point, or this fancy website and its crazy webmaster to guide you, try locating a single grave within a near 40 acre cemetery by yourself. blends in with the headstones in Mountain View Cemetery so perfectly that without all the above, you could be in real trouble! Guess how I know this. If you've stumbled once or twice trying to spot these on a first visit, consider yourself a true marker hunter! Here's a marker that holds the prestigious title of being the only marker in the state system with its text written entirely in two languages -- English and Chinese. 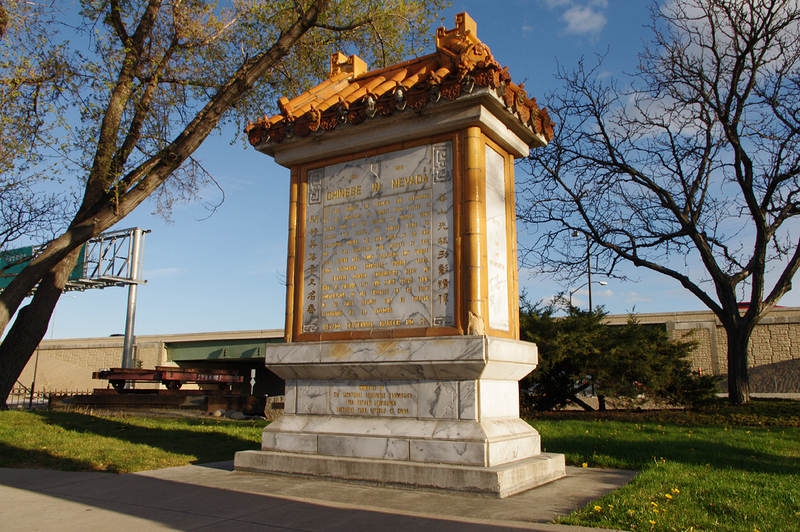 The marker's dedication date coincided with a Chinese festival at the time that honored the Chinese people and their contributions to Nevada. Prior to the festival, the Sparks City Council with the help from the SHPO, redesigned the marker from an original Stone slab to something exclusive - a true eye-grabber from commuters cruising down B Street in Sparks's Victorian Square. No doubt it's also one of the prettiest markers ever, constructed out of travertine marble with its text engraved in gold paint. Fun Fact! Upon its statehood in 1864, the number of Chinese in Nevada was staggering. Many historians have figured a tally for about twenty Chinese people for every white male, with most of the population residing along the Carson River in today's Dayton. With such a dramatic number, the newly-formed State of Nevada enacted a law stating that Chinese workers were considered "three-fifths of a person" and could not qualify as residents with a right to vote. The law was in effect until 1890. Despite the many historical markers, in all the interesting landscapes in our state,  - Powell of the Colorado is the only state marker within a U.S. National Park. Find this one hiding away beneath some trees on the Lake Mead National Recreation Area at Echo Bay on the remote north shore of Lake Mead. Fun Fact! Lake Mead National Recreation Area boasts some pretty impressive superlatives of its own. While most people know Lake Mead NRA mostly for its water play in Lake Mead itself, the NRA holds many more secrets still being discovered by the American visitor. Combining acreage in both Nevada and Arizona, the NRA manages two reservoirs, Lakes Mead and Mohave while preserving over seventy miles of the Colorado River in its natural and pristine condition -- a completely roadless river paradise from Boulder City to Laughlin. In this wild land, watercraft represents the only means of travel. Aside from its water complex, the dry land complex of the park hold some pretty impressive and little-known features -- slot canyons, freshwater springs, petroglyph fields, rugged mountains and waterfalls. Why not celebrate your history with not one, but two plaques? The original "Standard" version of  sits alongside Robinson Street on the south side of the building across from the Nugget Parking lot, moved in 2009 after an exterior renovation of the museum grounds. The newer "Metal" version was mounted on the front door of the old mint building (east side of the building facing Carson Street) in 1998. It's presumed that the SHPO supplied the U.S. Mint with this additional plaque during Nevada's 125-year centennial celebration. 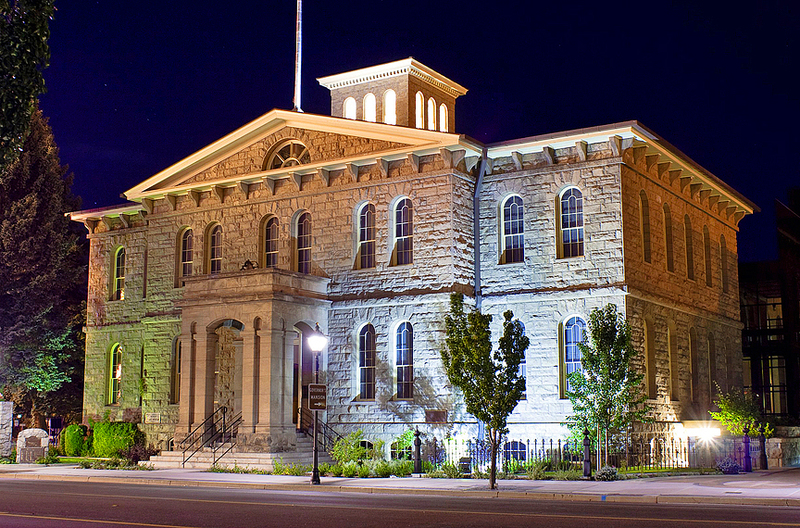 Fun Fact!The U.S. Mint Building at Carson City certainly wasn't the largest mint in the nation and it was far from the longest-lived. What it makes up for its short lifespan is the amazing amount of coinage produced during its short life. And the numbers don't lie: over $49 million in Comstock gold and silver was coined at Carson City from 1878-1896! Today, coins with a minted "CC" are rare and demand high dollars from coin collectors around the country. Before the construction of the I-580 freeway through Carson City, US Highway 50 had a total of 41 markers along its route across Nevada from the California State Line to the Utah State Line. In 2009, NDOT mandated a re-routing of US 50 via Fairview Drive and onto the freeway, eliminating its original route through downtown Carson City, and thus, lowering its count to 34 markers. 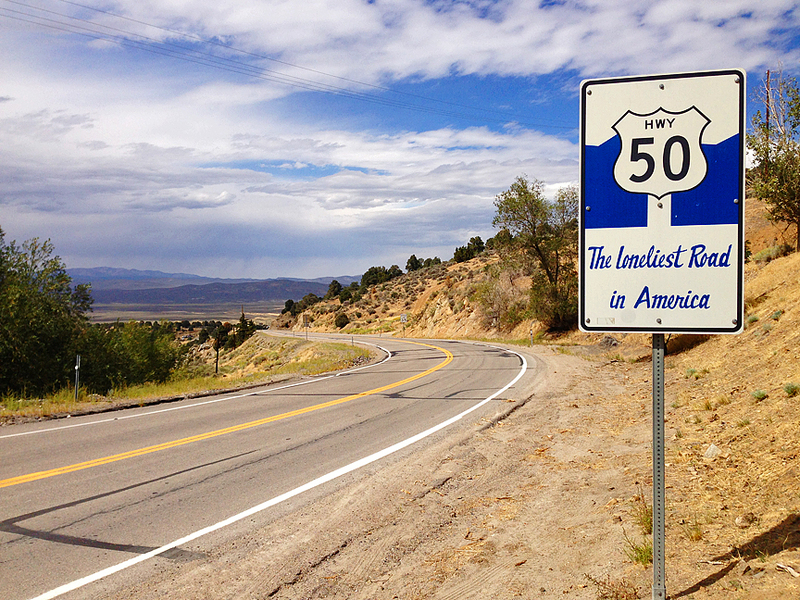 The cutting of seven markers didn't hurt its title one bit and US 50 is still crowned with the title of having the most markers of any highway in Nevada! We invite anybody new to the State Marker System to begin their hunting journey on US 50 bagging all 34 markers along the way. 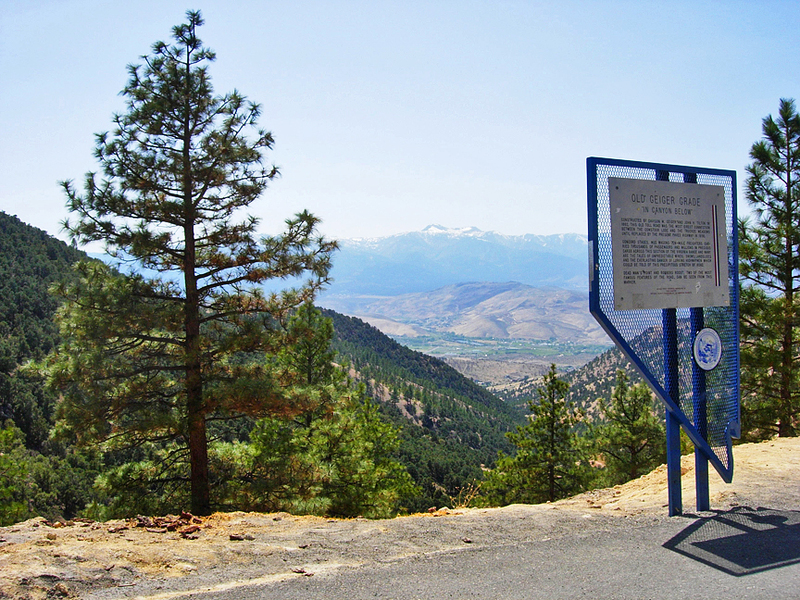 Home to the most historic markers in the state, Washoe County boasts its count of 42 markers with pride! 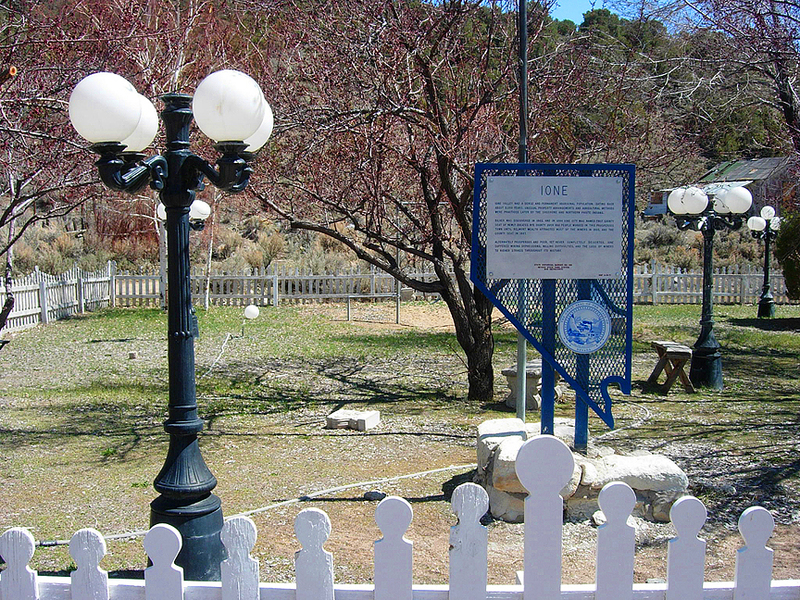 The majority of Washoe's markers coincide with the demands of the Comstock Lode while focusing intensely on the very first bit of urban growth in early Nevada. Washoe County is a land of great contrasts and bagging its markers will be one of the great joys of any marker hunter! 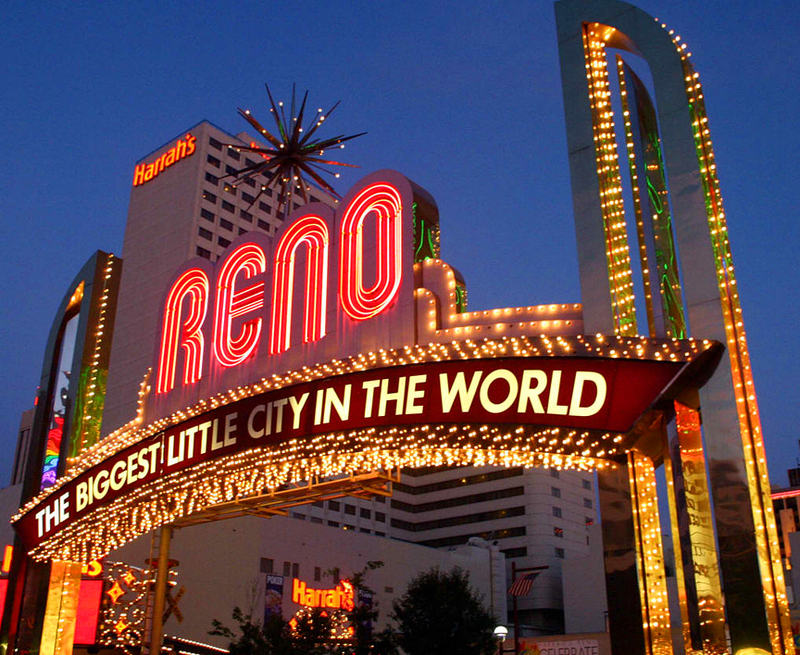 Although a good portion of its markers reside on urban streets, over half of them can be found in a grab-bag of diverse landscapes -- lush forests, alpine tundra, green ranching valleys, undisturbed canyons, primal deserts, and of course, the neon-ness of Nevada. 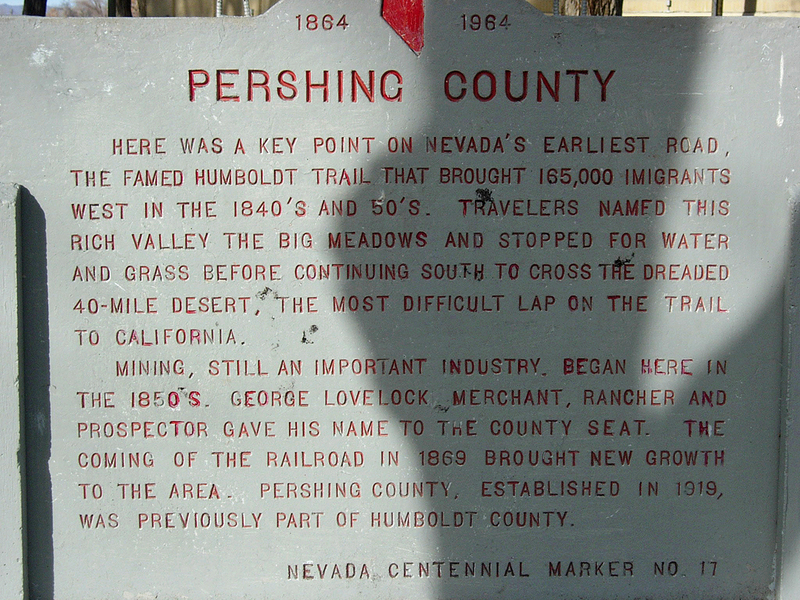 With only 6 markers strong each to their name, Mineral and Pershing Counties remain tied with having the least historic markers in Nevada. Ironically, each of these counties are well deserving of at least a dozen more in their respective counties. Defining this title was a bit tricky and the decision ultimately came down to technicalities within state government. Had the folks in State Congress left little Carson City a county, it would no doubt be the hands-down winner of this category. 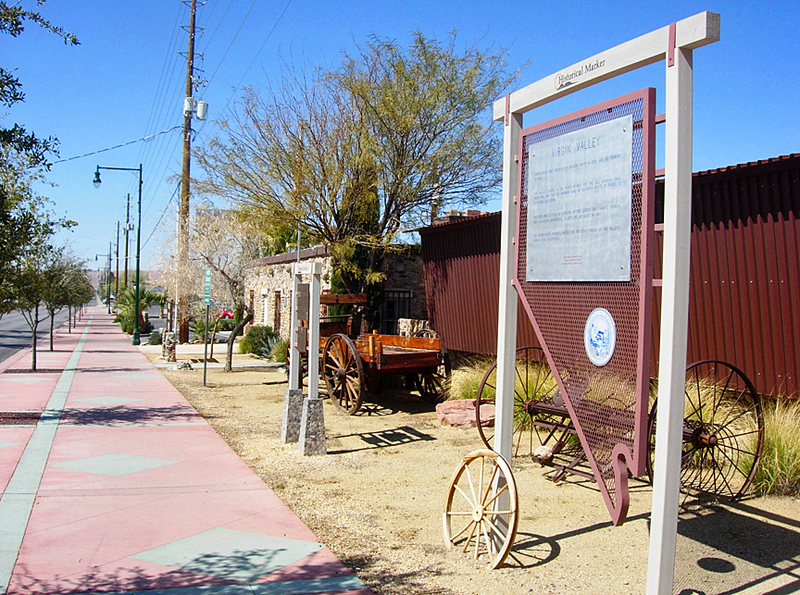 Even with its 29 markers, the most historic markers of any community in Nevada, Carson has been thrown out because it was declared a municipality in 1974. So where does leave us? The SHPO scattered 17 lovely markers throughout the city limits of Reno and unknowingly donned the city with a great superlative! Keep in mind this total count is minus Sparks, Verdi, and points surrounding. No this one isn't a joke. It's downright sad. Of all 17 seats in Nevada, sleepy Yerington wins this embarrassing title by having ... wait for it ... ZERO historic markers! It's curious as to why the SHPO somehow missed this considering Lyon County is chock full of history. For the record SHPO, we can name at least 3 places in Yerington alone that are worthy of a state marker. Future marker anyone?